Tom Ince scored the winner as Derby came from behind to secure a place in the Championship play-offs by beating lowly Bristol City. 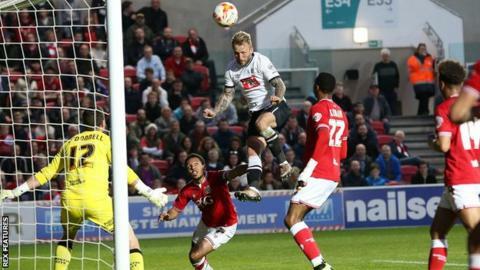 Johnny Russell's header gave the visitors a lead which lasted barely a minute as Jonathan Kodjia levelled. Bobby Reid scored from distance as City led at half-time, but Derby struck back shortly after the break. Craig Bryson levelled from 12 yards before Ince put his team ahead with a left-footed shot across goal. It is the first time Derby have won four successive league games since April 2014 and victory, combined with Cardiff City's defeat at Brentford, ensures they will finish the season inside the top six. With three games remaining, Derby are level on points with fourth-placed Hull, who enjoyed a late victory over Reading and have a game in hand. Bristol City showed commitment throughout the match but it was an error-strewn performance. The defeat, plus MK Dons' draw at Sheffield Wednesday, means City still need a point to guarantee Championship survival. "I'm disappointed with the result and angry at the performance. We were naive tonight and didn't communicate as well as we needed to. "The players gave everything and the problem was our quality, not our attitude. "You can't make as many mistakes in succession as we did against a good side. That's me being honest." "That's four wins on the trot, the first time we have done that for two years. "Now we want to extend that run right through to the play-offs because it's important we go into the semi-finals in the best possible form. "It was the ideal result for us after trailing 2-1 at half time. We knew it would be tough because Bristol City have been in good form at home recently. "I'm delighted with the way the players responded in the second half. In the end we could have had more goals." Match ends, Bristol City 2, Derby County 3. Second Half ends, Bristol City 2, Derby County 3. Markus Olsson (Derby County) is shown the yellow card. Attempt missed. Craig Bryson (Derby County) right footed shot from the right side of the box is high and wide to the left. Assisted by Cyrus Christie. Attempt saved. Chris Martin (Derby County) right footed shot from outside the box is saved in the centre of the goal. Assisted by Tom Ince. Substitution, Bristol City. Aaron Wilbraham replaces Lee Tomlin. Corner, Bristol City. Conceded by Cyrus Christie. Corner, Derby County. Conceded by Scott Wagstaff. Attempt blocked. Jacob Butterfield (Derby County) right footed shot from outside the box is blocked. Assisted by George Thorne. Offside, Derby County. Scott Carson tries a through ball, but Chris Martin is caught offside. Substitution, Bristol City. Peter Odemwingie replaces Bobby Reid. Corner, Bristol City. Conceded by Jason Shackell. Attempt missed. Jonathan Kodjia (Bristol City) right footed shot from the right side of the box is close, but misses to the right. Assisted by Marlon Pack. Attempt saved. Craig Bryson (Derby County) left footed shot from outside the box is saved in the centre of the goal. Assisted by Chris Martin. Corner, Derby County. Conceded by Joe Bryan. Attempt saved. Jason Shackell (Derby County) header from the left side of the six yard box is saved in the top left corner. Assisted by Jacob Butterfield with a cross. Corner, Derby County. Conceded by Richard O'Donnell. Attempt blocked. George Thorne (Derby County) header from the centre of the box is blocked. Assisted by Jacob Butterfield with a cross. Corner, Derby County. Conceded by Adam Matthews. Goal! Bristol City 2, Derby County 3. Tom Ince (Derby County) left footed shot from the left side of the box to the bottom right corner. Assisted by Chris Martin. Corner, Derby County. Conceded by Aden Flint. Attempt blocked. Cyrus Christie (Derby County) left footed shot from the right side of the box is blocked. Assisted by Johnny Russell.